Colder. Awake at six for a pee – too early! Snuggle down for another hour. Inflate swiss ball, much to baffled amusement of Tudor, and wobble about improving core stability for a bit. 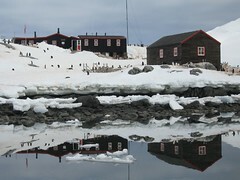 We have one day to prepare Port Lockroy for first proper ship visit, which is happening a day earlier than scheduled. Much of morning spent dusting and moving boxes of stock. I leave the others to be anxious about how to display all the permutations of t-shirts (sizes, colours, shapes) – there are so many. At morning break I make tea wrong! Milk powder must be treated with delicacy to prevent scorching… Then an inquisitive sheathbill leaves a calling card, which I, not noticing, tread into soles of indoor slippers. Hmm. Oh and I’m also gutted to discover that there’s no sign of the wonderful nut bars sponsored by Eat Natural. Food packers don’t remember them. Apparently they were delivered… a mystery. Stomach is churning, adjusting to a change of diet; it’s impossible to include enough protein. Oh dear. Progress is slow, but continuous, sledging and carrying boxes up and down from boat shed to shop, snow softening in the sun. Feel like a cart horse, harnessed up. Slowly, slowly each item finds its place and receives a price label. Great Mulligatawny soup out on the sundeck suntrap, which has a wee seat carved out of the snowdrift. More and more penguins are settling back on to the island, emerging from the water, ruffling feathers, congregating at their nesting sites. Speedy snow wash, standing on warm rock down by the landing site; top half naked, then bottom, hugely invigorating. Feels good, except for stray drips of ice down thermal trous as I pull them back up! Back on the job, slightly frantic towards evening when there still appears to be hours worth of work ahead. Rick brings speakers through because we’re concentrating too hard to sing and lift our spirits. He also fuels us with tuna mayo pasta and spicy bowls of soup. Inaugural trip up the Stairway to Heaven with loo and slop bucket. It’s slippery and slidey and scary and the light is flat. Clouds have covered us over. Thank goodness Tudor accompanies me, and kindly demonstrates how to balance on rock to swill bucket without waves lapping on feet. V tired and quiet. Bed around eleven.